Genes are the basic units of inheritance and we all carry genetic variation, which determine physical differences between people, for example in eye or hair colour, and height. We have similar genetic variants to our immediate family. Around 5% of people with Parkinson’s have a strong genetic contribution to the development of the illness, and this may be indicated by a strong family history of other people affected by Parkinson’s or an early age at onset. There are two common forms of inheritance: dominant and recessive. We each have two copies of each gene, one from our mother and one from our father. In dominant inheritance a single gene variation (a “spelling mistake” in a gene) is passed from generation to generation and children each have a 1:2 chance of inheriting the variant. This does not always lead to disease. In recessive inheritance the risk relates to carrying two gene variants and typically there is an increased risk to brothers and sisters but not to children or parents. Recessive inheritance seems to be more important in early onset Parkinson’s, occurring in people before the age of 40. 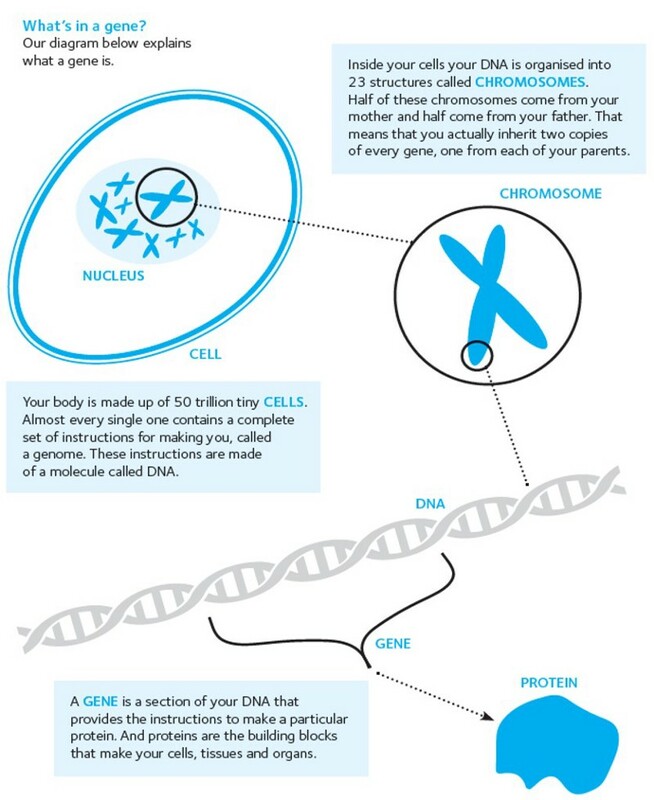 The human genome contains 23,000 genes — because we have two copies of each that’s 46,000 in total. These genes act as the blueprint that makes us. We all share the same basic blueprint but there are subtle variations that make each individual’s genome unique. These differences in our genes are what make us all different. Most of these variations are harmless but sometimes a gene has a difference that means the protein it produces does not work as well as it should. These genetic differences are called variants or mutations and can increase the risk of particular illnesses. Illnesses that are directly caused by a change in a single gene are very rare. Like most of our characteristics, our health is generally the result of a mixture of different genes coupled with other factors like diet and exercise. What is the risk to other family members of developing Parkinson’s? Usually Parkinson’s is not an inherited condition. It is rare for people with Parkinson’s to have affected children. Even in families where we know that there is a genetic cause, not everyone who inherits the gene variant will develop the disease. The most accurate advice depends on your personal and family history and on the results of any NHS tests that you may have done. If this is something that you or your family are worried about we would recommend that you discuss this with an NHS genetic counsellor and we can arrange for this by liaising with your local consultant and family doctor. Parkinson’s is an ‘idiopathic’ condition, which means that it usually isn’t connected to any particular cause. However, for a small minority, Parkinson’s can be caused by changes in single genes. For other people, genetic variations can play a part in increasing the risk of the condition. It’s a complex and changing picture but, so far, changes in around 10 different genes have been linked to different effects on the risk of Parkinson’s. Let’s take a closer look. Around 1 in 100 people with Parkinson’s carry a very rare change in a gene that causes the condition directly. Changes have been identified in genes including alpha synuclein, parkin, PINK1, DJ-1, ATP13A2, PLA2G6, FBXO7 and VPS35, and often cause symptoms to develop at a young age. A change in the LRRK2 gene known as G2019S is probably the most common genetic variant linked to Parkinson’s. 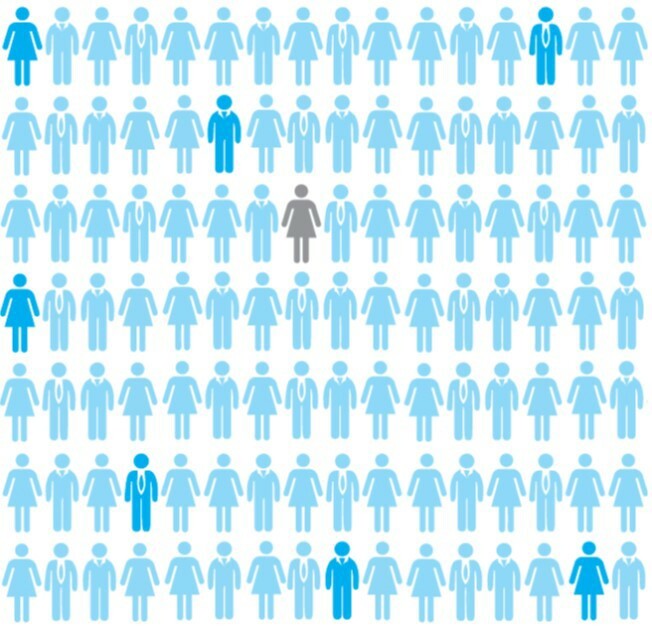 In the UK, around 1 in 100 people with Parkinson’s carry it. It’s more common in North African and Ashkenazi Jewish populations. People who carry this variant may develop the condition later in life and have around a 70% chance of being diagnosed by the age of 80. As well as single genetic changes that directly cause the condition, we now know that there are also changes that increase risk. These changes are more common but their effects are more subtle. Carrying one of them means you are more likely to develop Parkinson’s but often only very slightly. The most common of these changes was discovered in 2004 when doctors noticed that patients with a rare genetic disorder called Gaucher’s disease often had relatives with Parkinson’s. Gaucher’s is caused by inheriting two faulty copies of the GBA gene, one from each parent. Research has shown that people who carry just one faulty copy of GBA are more likely to develop Parkinson’s. "I believe that genetics will improve life for people with Parkinson’s in the future by helping us to provide much more personalised treatments to individuals. Parkinson’s is a very variable condition. People develop it at different ages, experience different symptoms, and respond differently to treatments. I think genetics may help us understand this better, and hopefully one day we will be able to look at a person’s genetics to help us choose the right treatments for that individual." How concerned should I be if Parkinson’s runs in my family? Parkinson’s is a relatively common condition, so it’s fairly common for people with Parkinson’s to have one other member of their family who is also affected by the condition. 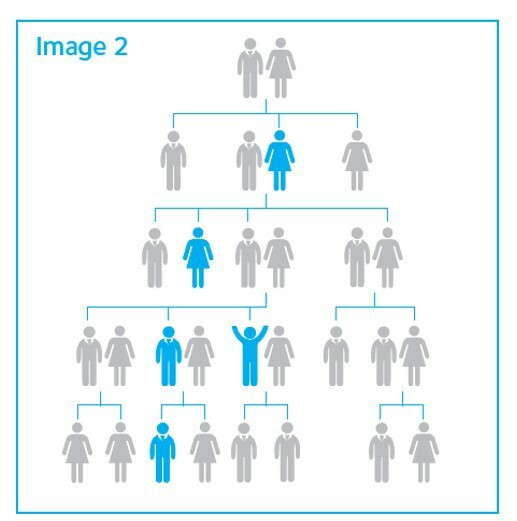 If your family looks like image 1 (below) the likelihood of you carrying one of the gene variants we currently know cause inherited Parkinson’s is still low — around 1 in 50. It’s not unusual for more than one individual in a family to have Parkinson’s. It’s less common for Parkinson’s to affect several members of the same family and this would increase the chance of having a single gene cause. 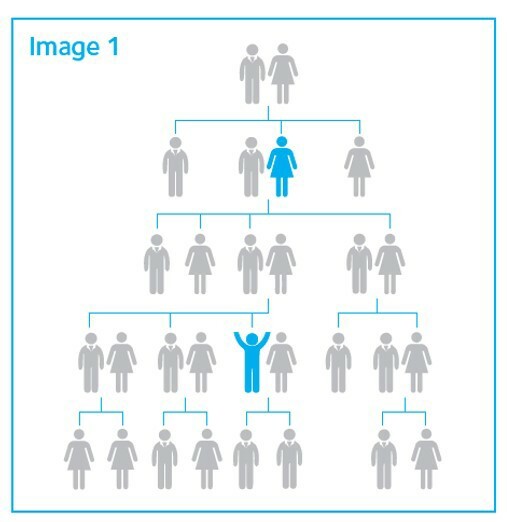 But even if your family looks like image 2 (below) you still only have around a 1 in 10 chance of carrying one of the known genetic variants. There are likely to be more genetic changes for Parkinson’s that have not yet been identified, so this may change over the coming years. If you have a number of relatives with Parkinson’s, it’s more likely there could be a genetic factor involved. Q. Is genetic testing available on the NHS? Yes, genetic testing is available but the directly inherited genetic forms of Parkinson’s are very rare and there are currently no treatments that can prevent the condition. We would usually consider genetic testing for people who develop the condition early (before the age of 40) or who have a strong family history, with several people in the family affected. If you are considering genetic testing it’s important that you fully understand what it means before it’s carried out. Some people may find it helpful to talk to a genetics specialist (a doctor or a counsellor) before proceeding with genetic testing. We would recommend that all patients and or families with a positive genetic test have access to genetic counselling to help them understand the possible implications. Click here for a list of UK Genetic Counselling Locations. This is taken from an article written by Claire Bale, Head of Research Communications and Engagement, Parkinson’s UK.